Time Teacher candidates who qualified intermediate they are eligible to apply. For Lohardaga Middle Schools Primary Teachers Degree in respective subject is required to apply. However Higher qualifications having candidates are preferred for this Lohardaga District Part Time Teacher Posts. Available subjects are English, Maths, Science and Social Science. 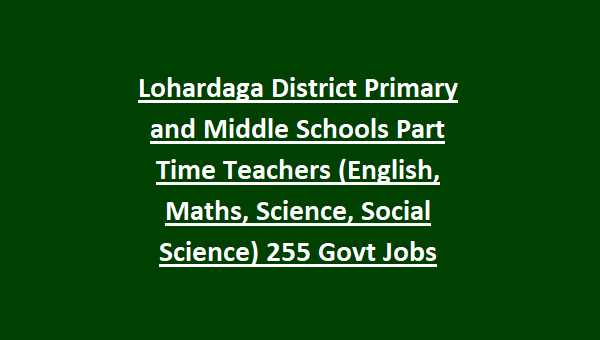 There are total 255 posts in this Lohardaga District Part Time Teachers Recruitment 2018. Interested candidates can apply in a prescribed for this Part Time Teachers Posts of Lohardaga district recruitment 2018 notification. Candidates selection will be based on qualifications and walk in interview for this Part Time Teachers Jobs. More information about this Lohardaga District recruitment notification of Part Time Teachers Jobs in Govt Primary and Middle Schools are given below. Application form is available in official website of www.lohardaga.nic.in. Last date to reach application form to Lohardaga District Secondary Education department is 18-08-2018. Merit list dates will be updated soon. 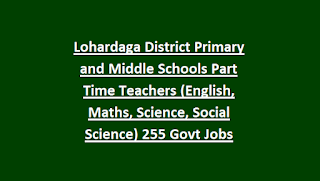 There are total 255 Part Time Teachers jobs in this Lohardaga District recruitment of Primary and Middle Schools. Upper age limit for all the candidates is 65 years for this Lohardaga District teachers recruitment of government primary and middle schools. For Primary Schools Teachers-Intermediate qualification is required. Higher qualifications having candidates are preferred. Salary will be given hours basis. Per Rs.120/- will be paid. Candidates selection will be based on qualifications and personal interview. At the time of attending the interview candidates must have produce all original documents for verification. After verification of received applications candidates are called for personal interview. Higher qualifications having candidates are preferred. A merit list or short list or interview dates will be displayed in Lohardaga District official website at www.Lohardaga.nic.in. Application form is available for download at www.Lohardaga.nic.in website. Last date to reach the filled application form along with all the supporting documents is 18-08-2018. Download Application form and official notification here for Lohardaga District Part Time Teacher recruitment.